From the annals of bad science reporting comes this latest confusion: Media outlets completely misconstrued the results of a study about a supposed selfie mental disorder—a study that itself was inspired by a hoax that also fooled media outlets three years earlier. The problem with all these headlines and articles is that the classification of a new mental disorder doesn’t happen from a single research paper—and not even the authors of the study claim to have identified a new mental disorder. Here’s the context. In 2014, a few outlets, including Yahoo News, were taken in by a story from The Adobo Chronicles that reported the American Psychiatric Association had recently enshrined “selfitis” as a new mental disorder following an annual board meeting. The article defined the condition as an “obsessive compulsive desire to take photos of one’s self and post them on social media as a way to make up for the lack of self-esteem and to fill a gap in intimacy.” Aside from some glaring inaccuracies—the American Psychiatric Association meets more than once a year and that’s not how they add new diagnoses—The Adobo Chronicles is a plainly satirical news site, with such recent headlines as: Speaker Paul Ryan: No, I Didn’t Screw An Altar Boy! The fictitious story described three levels of selfie obsession: Borderline, Acute, and Chronic. 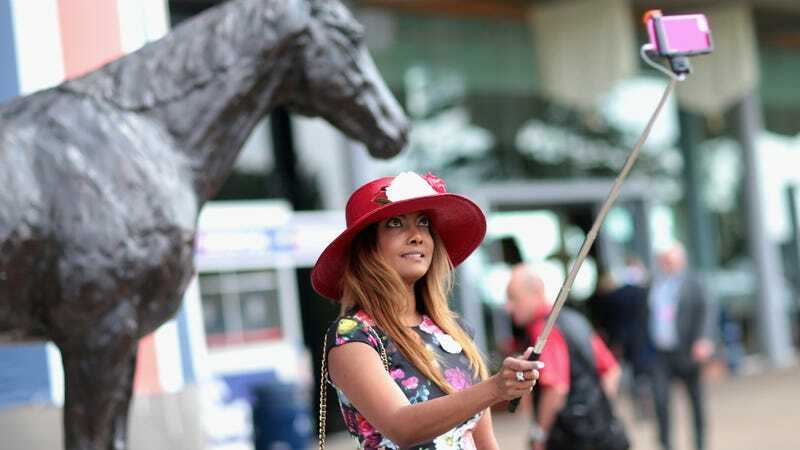 Borderline selfie-takers would snap up to three shots of themselves a day but not post them on social media, while chronic “sufferers” would have an uncontrollable urge to selfie all the time and post six or more shots a day on social media. Years later, Griffiths and his co-author, Janarthanan Balakrishnan of the Thiagarajar School of Management in India, decided to conduct a real study based on the hoax. Their research was published this November. Via focus groups, the researchers interviewed more than 200 college students in India, a country with more Facebook users than anywhere else, about their selfie habits. They wanted to find out if you really could group people into the three categories described in the satirical article. Perhaps unsurprisingly, they did find that about two-thirds of the students could fall into one of these levels. They also asked them why they selfied, and grouped their responses into six broad reasons, from wanting to compete socially with their friends (“I feel I am lost when my friends get more likes and comments for selfies than me,” said one respondent) to sprucing up the occasion (“Taking selfies in a specific environment helps me to remember the moment for a long time,” said another). Lastly, they surveyed another larger group of selfie-takers and found that the more they loved to take selfies, the more they were motivated by these six factors. That suggests, the authors wrote, that there is something we could call “selfitis” and you could diagnose it easily enough using the scale they developed. That’s interesting, sure, but as the authors themselves admit, it was just an “exploratory” study that could lead to more research of the concept. The study absolutely doesn’t, as The Guardian put it, prove “beyond all doubt” that taking lots of selfies is an actual mental illness. Which, again, even the authors are clear about. I still think Griffiths and his co-author are overreaching by even calling “selfitis” a condition at this point. While obsessive selfie-taking was associated with some unhealthy traits in their study, like low self-esteem and being overly attention-seeking, that doesn’t necessarily mean it’s worth coining a specific psychological term to describe it. And as the authors wrote, unlike an established mental disorder like depression, selfie-taking can provide plenty of positive feelings and social rewards. If you’re still not convinced that selfitis is fake news, just ask the American Psychiatric Association. They have a mildly snarky page dedicated to debunking this hoax.